I've done a lot of research and it looks like the only way to run Apple iOS shortcuts is manually - i.e. you have to manually do the trigger - either by pressing a button, getting Siri to do it (by 'manually asking') or by (manually) getting another app to run it. I've yet to be able to get another app to run it automatically (yes, I'm sure this is to do with security/privacy implications, but if it's based on a shortcut that's only on my phone, then I'm happy with the security/privacy). I've looked at getting IFTTT to run the trigger (which it can do - for example, based on my location, or based on the start of an event in my Google Calendar), however the 'most' I can then do is to get that trigger to run an IFTTT Rich Notification on my iPhone - yes I can then click on that notification pop-up (which launches a shortcut via shortcuts://open-shortcut?name=[name]), but that still relies on me clicking the shortcut. A couple of people have run iOS shortcuts as the trigger for an IFTTT action, but I'm trying to do this the other way around. Unfortunately this is not possible (yet). It's a known limitation of Shortcuts in its current 2.0 implementation. I was looking for the same thing, but I believe that running shortcuts automatically without user interaction is not going to happen anytime soon in iOS. 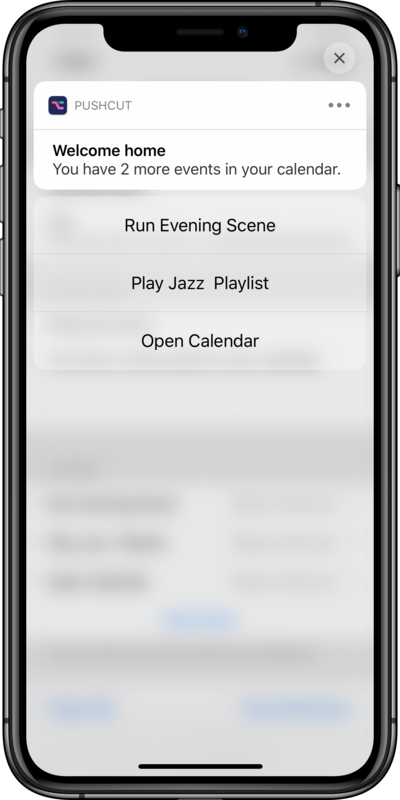 Since I never really liked how the workarounds felt like, I solved this problem for myself and made an app called Pushcut that integrates push notifications with shortcuts. You can run linked shortcut with one tap on a notification, or define multiple options as actions. Not "automatic in the background", but as close as you can get with iOS. I use it mainly with my openHAB home automation and IFTTT webhooks - but it is quite versatile. I hope somebody else finds this useful too. Simon Leeb is a new contributor to this site. Take care in asking for clarification, commenting, and answering. Check out our Code of Conduct. I was also trying to make the Shortcuts work without my manual input. I think due to security reasons Apple will not allow triggering Shortcuts without user action, though that's not specified in their iOS Security Guide. I've tried repeat and wait commands, but the shortcut stops execution if you turn off the screen. There is a lot to do with Shortcuts app is it is, more integrations and apps to be added, stability and performance improvements required, so I think Apple will continue to work on the app itself and may add this feature much later. Launch Center Pro allows you to set locations triggers for actions. Use the Workflow/Shortcuts Action to trigger a shortcut at a location or certain time. It’s not quite what you’re looking for as it still requires tapping a notification, but it might work for you in certain situations. I guess the best for now is, that you can add your own shortcut as a reminder. Then when it appears on the screen just tap on it and it will execute whatever, but it still requires some interaction. It appears that you can now trigger events when you leave or arrive or leave a location. Check the Shortcut gallery. You can use an app called "launcher pro" that will trigger a shortcut based on location. So long as the location is setup within launcher pro. Not the answer you're looking for? Browse other questions tagged iphone ios shortcut siri . How do I restore a jailbroken iOS 6.1/iPhone 5? iOS 11 Safari: How to pass user/password in URL for Basic Authentication?